A Great Low Mileage Commuter. UK Delivery Available. 2015 15 HONDA NC750 SD-E A Great Low Mileage Commuter. UK Delivery Available. 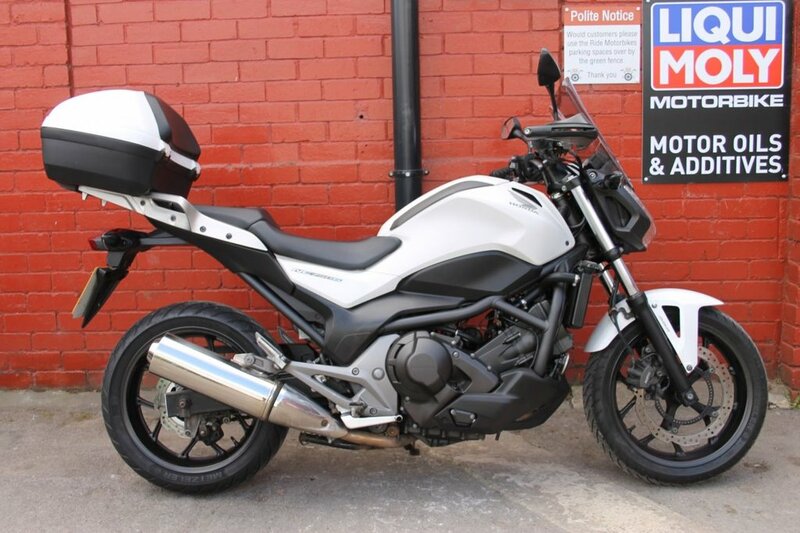 Here we have a Honda NC750S DCT in White will 12K on the clock. FSH. All her keys and booklets. Recent Honda service at 12500 miles. 5 stamps to date. Mot runs until April 19. Finance deals available tailored to your budget. Credit and debit cards accepted. UK delivery from £120. She will leave us with a full PDI and a 3mth Ride warranty. Nationwide WMS warranties are available at reasonable prices. She benefits from Handguards, top box and a centre stand. The NC 750s is a great commuter, that is very economical and cheap to maintain and run. The auto transmission suits city riding but are capable of touring and rides out of the weekend. With Honda's reliability and build quality, you won't go far wrong with one of these. You have a drive and sports mode at the click of a switch and a handbrake on the bars as well. Ride is a friendly down to earth business with a passion for biking. Nationwide Delivery, HPI Clear, PX Welcome, Friendly Customer Service. 01535 658811 ***Check out our customer reviews on the website, at Ride Motorbikes Ltd Facebook page/Autotrader shop and google*** For more information about us, the bike and our stock please visit our website. The adventure starts here! Open 7 Days A Week Ask us about Locks and Chains, Datatags, Helmets and Heated Grips. Stay warm and secure with Ride.